Surgical site infection (SSI) is an infection occurring in an incisional wound within 30 days of surgery and significantly affects patients undergoing colorectal surgery. 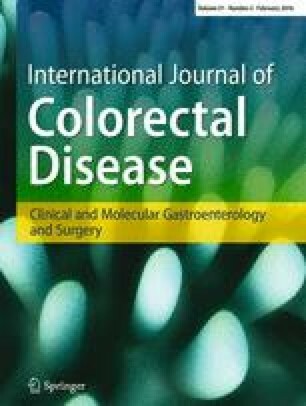 This study examined a multi-institutional dataset to determine risk factors for SSI following colorectal resection. Data on 386 patients who underwent colorectal resection in three institutions were accrued. Patients were identified using a prospective SSI database and hospital records. Data are presented as median (interquartile range), and logistic regression analysis was used to identify risk factors. Patients (21.5 %) developed a postoperative SSI. The median time to the development of SSI was 7 days (5–10). Of all infections, 67.5 % were superficial, 22.9 % were deep and 9.6 % were organ space. In univariate analysis, an ASA grade of II (RR 0.6, CI 0.3–0.9, P = 0.019), having an elective procedure (RR 0.4, CI 0.2–0.6, P < 0.001), using a laparoscopic approach (RR 0.5, CI 0.3–0.9, P = 0.019), having a daytime procedure (RR 0.3, CI 0.1–0.7, P = 0.006) and having a clean/contaminated wound (RR 0.4, CI 0.2–0.7, P = 0.001) were associated with reduced risk of SSI. In multivariate analysis, an ASA grade of IV (RR 3.9, CI 1.1–13.7, P = 0.034), a procedure duration over 3 h (RR 4.3, CI 2.3–8.2, P < 0.001) and undergoing a panproctocolectomy (RR 6.5, CI 1.0–40.9, P = 0.044) were independent risk factors for SSI. Those who developed an SSI had a longer duration of inpatient stay (22 days [16–31] vs 15 days [10–26], P < 0.001). Patients who develop an SSI have a longer duration of inpatient stay. Independent risk factors for SSI following colorectal resection include being ASA grade IV, having a procedure duration over 3 h, and undergoing a panproctocolectomy.